PARIS, France -- The swollen Seine River kept rising Friday, spilling out across its banks and some streets in Paris as curators at the Louvre scrambled to protect a huge trove of art from the museum's priceless collection from the flooding. The Seine, which officials said was at its highest level in nearly 35 years, was expected to peak sometime later Friday. Nearly a week of heavy rain has led to serious flooding across a swathe of Europe, where 14 people have died and more are missing. Although the rain has tapered off in some areas, floodwaters are still climbing up over scores of river banks. 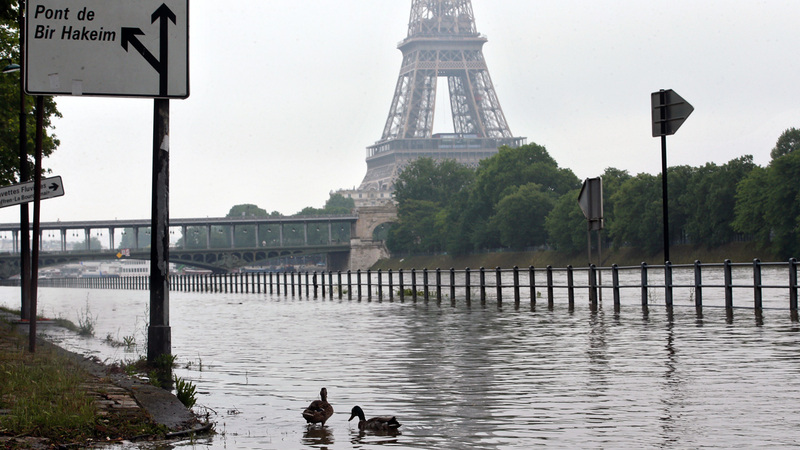 Traffic in the French capital was snarled as flooding choked roads and several Paris railway stations were shut. While the Louvre's most famous painting, Leonardo da Vinci's "Mona Lisa," was safe on an upper floor, officials said about 250,000 artworks were located in flood-risk areas, mostly in basement storerooms. The art was hastily being moved upstairs - a move officials described as precautionary. The Orsay museum, on the left bank of the Seine, was also closed Friday to prepare for possible flooding. A spokeswoman at the Louvre said museum had not taken such precautions in its modern history - since its 1993 renovation at the very least. She spoke on condition of anonymity in line with the museum's policy. At the Louvre, disappointed tourists were being turned away. "I am really sorry, but we're closed today," one staffer told visitors. "We have to evacuate masterpieces from the basement." German authorities said the body of a 65-year-old man was found overnight in the town of Simbach am Inn, bringing the country's death toll to 10. France's Interior Ministry also reported the death of a 74-year-old man who fell from his horse and drowned in a river in the Seine-et-Marne region east of Paris, the second death in France. In eastern Romania, two people died and 200 people were evacuated from their homes as floods swept the area, including one man who was ripped from his bicycle by a torrent of water in the eastern village of Ruginesti. Several other people in Europe were missing Friday, including a Belgian beekeeper who was swept away by the current while trying to save his hives from rising waters in the eastern village of Harsin. The foul weather has compounded the travel disruptions in France, which is already dealing with the fallout from weeks of strikes and other industrial actions by workers upset over the government's proposed labor reforms. French rail company SNCF said the strikes had led to the cancellation of some 40 percent of the country's high-speed trains. In addition, French energy company Enedis says that more than 20,000 customers are without power to the east and south of Paris. Outside the Louvre, tourists expressed understanding over the museum's closure. "It's good that they are evacuating the paintings. It's a shame that we couldn't see them today, but it's right that they do these things," said Carlos Santiago, who was visiting from Mexico. Mstyslav Chernov and Sylvie Corbet in Paris, John-Thor Dahlburg in Brussels, David Rising in Berlin and Alison Mutler in Bucharest, Romania, contributed.